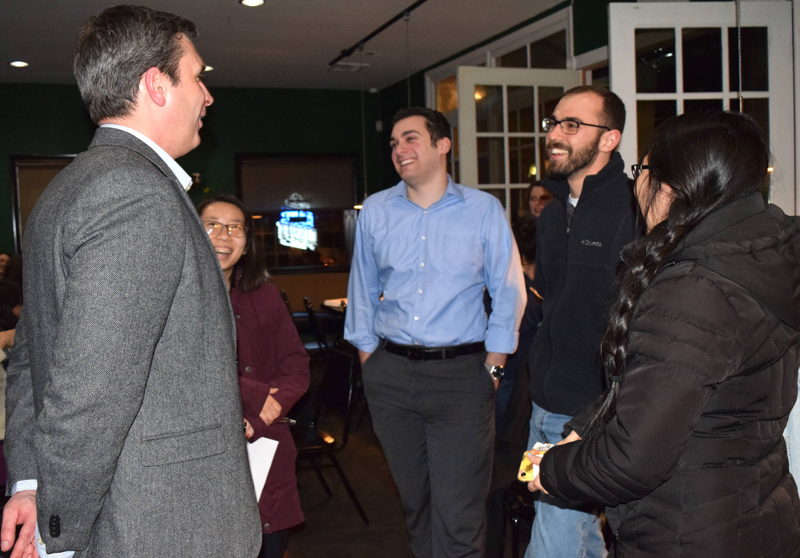 “Very few people are moral relativists – most are confused,” Dr. Michael Rombeiro told the 40 young adults gathered for the Theology on Tap session “Responding to Relativism” Jan. 14 at Hops at the Paddock, Allentown. Rombeiro is professor of philosophy at St. Charles Borromeo Seminary, Philadelphia. In a culture that reflects universal truth in favor of convenience, how can Catholics respond charitably yet effectively to relativism? Rombeiro discussed the confusion that stems from relativistic thinking in society, the importance of moral absolutes and the role of Catholics who strive to follow Church teaching. Theology on Tap is a monthly series sponsored by the Diocesan Office of Youth, Young Adult and Family Ministry (OYYAFM). The series is designed to welcome young adults ages 21 to 35, single or married, in a casual setting where they can grow in the faith and share community with one another. It originated in the Archdiocese of Chicago, Illinois. Alexa Smith, assistant director of OYYAFM, welcomed those gathered. Rombeiro said a subjective statement is about the perceiver, and an objective statement is about the object. For example, “George feels the test is unfair” is subjective, but “The test is unfair” is objective. Rombeiro said an absolute truth is a statement that is true independent of other factors, like two plus two equals four. A relative truth depends on other factors, such as January is in winter is a statement that depends on which hemisphere you are in. Rombeiro noted St. Thomas Aquinas said the three aspects of a moral act are the act itself, intention and circumstances. 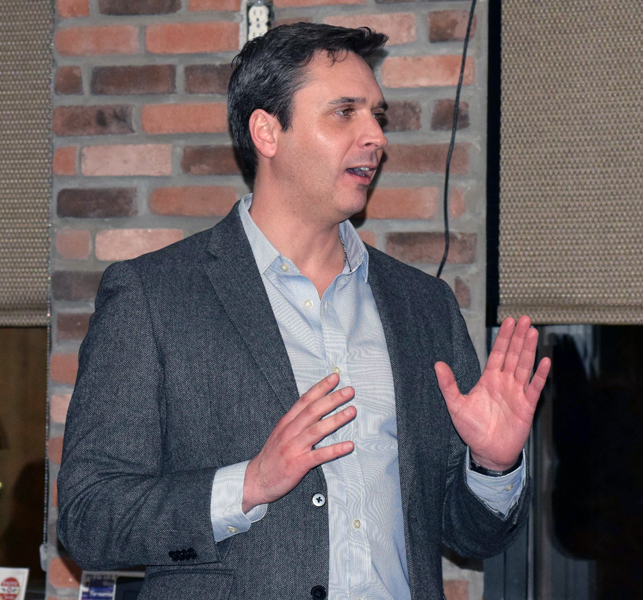 “The subject’s intentions and relative circumstances do matter,” Rombeiro said. “In moral relativism, all value judgements are about the subject and not the object,” he said. For example, if you see a robbery, you think it’s bad, but if you are the robber, you think it’s good. “In real hardline radical relativism, there really is no good or bad, right or wrong. You decide,” Rombeiro said. “Traditionally, we have an intellect that can get past appearances and grasp reality. In moral relativism, you say if I can’t see human nature, I can’t know it, maybe it doesn’t exist,” Rombeiro said, adding the groundwork for moral relativism was laid out in the 1880s. “It’s basically secular humanism,” he said, which is humanism, with regard in particular to the belief that humanity is capable of morality and self-fulfillment without belief in God. There are three ways to respond to all this: don’t base decisions on right or wrong; take a tolerant, nonjudgmental approach; or judge moral acts to be good or bad. “If you choose not to judge, you’re really saying it’s permissible, so it’s the same as not basing decisions on right or wrong,” Rombeiro said. He said most illegal acts are clearly morally wrong, such as murder and robbery. On the other hand, some legal acts are immoral, ambiguous or moral. “People are confused because they say their values are relative, but they don’t really believe it – if you point it out, they’ll say yes, there are objective values,” Rombeiro said. “If someone sees you living a fulfilled life of integrity, they will want to know what that’s about,” Rombeiro said. The next Theology on Tap, “Why Stay in the Church?” presented by Deacon Tony Belitto of St. Stanislaus, Lansdale, is slated for Monday, Feb. 11 at 7 p.m. at Hops at the Paddock. Theology on Tap events are free of charge. Food and beverage can be ordered from the menu at the event site. For more information, click here or email Smith at asmith@allentowndiocese.org. 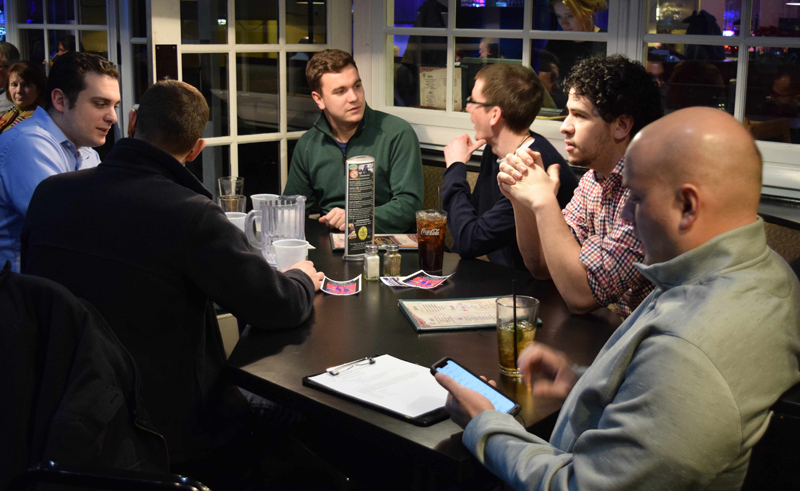 Young men gathered for the event are, clockwise from front left, Andrew Ivankovits, John Pellosie, Peter Carley, Andrew Kuchera, John Paul Pepen and Brett Kita. “If someone sees you living a fulfilled life of integrity, they will want to know what that’s about,” Dr. Michael Rombeiro tells young adults. Dr. Rombeiro chats with, from left, Tina Tran, John Pellosie, Andrew Ivankovits and Isaaca Lee.